Think she could work in a Handlock? for some reason I always thought she said "die or DIE! or both..." and I feel the death sound would be funnier that way. oh well. it's still kinda funny. Keep in mind that she doesn't trigger the draw if she dies to aoe alongside other minions. Learned it the hard way playing versus a priest who thoughtstole my Explosive Trap. I just tried this card in Zoo and it seems to work very well with my Imps. When I saw this card (long long time ago) my impression was, this is 4/2 for 4-drop, no way, but when I compared card draw for decks that desperately needs more cards this minion looks really good. Of course you need cards that generates minions like Unleash the Hounds or Imp-losion, but even Imp Master, Haunted Creeper or Violet Teacher works good enough to use this one. This was my first gold card I unpacked. This was one of the first cards I unpacked. Good ol' bloodlust shaman loved this card. Glanced over this card today for like the 100th time. Wait holy f**k is cult master bald..... yep she is. Please come back pansear. There are more golden animations for you!!!! 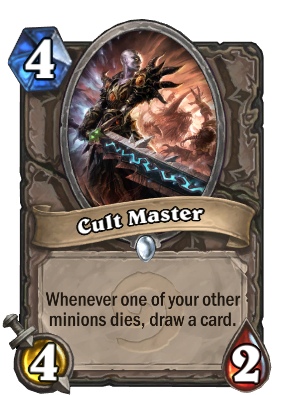 This is the card that goes "Join or die or both"